DVI has the specialized expertise to investigate accidents involving experimental amateur-built aircraft. An Experimental Aircraft Expert has to understand the intricacies of aircraft design, aircraft performance, fabrication methods, aircraft maintenance, and flight test methodologies. The challenging aspect to investigating accidents involved experimental aircraft stems from the highly unique nature of each design. Typical homebuilt or amateur built aircraft are customized to the likings of the builder, unlike a standard type certificated aircraft. The builders of a homebuilt aircraft have the latitude and ability to modify designs, specify their own building materials, and make an endless number of modifications. A Homebuilt Aircraft Expert has to be able to evaluate the effects of the choices made by the builder to accurately reconstruct and explain an accident. Experimental amateur-built aircraft represent a significant, and growing, proportion of the General Aviation fleet in the United States and around the world. According to the FAA‘s 2010 General Aviation and Part 135 Activity Survey, they account for nearly 10 percent of general aviation aircraft, and 4 percent of the hours flown in general aviation. The experimental amateur-built category was first adopted in Civil Aeronautics Manual in 1952, and early experimental amateur-built category aircraft were primarily the original designs of their builders or aircraft built from plans shared between builders. The first kits, which consisted of factory-fabricated components and sub-assemblies, were introduced in the 1970s and kit-built experimental amateur-built category aircraft now constitute the largest proportion of experimental aircraft. The FAA publishes, on its website, a listing of kits that have been evaluated and found eligible in meeting the requirement of 14 CFR 21.191(g). The FAA first identifies an aircraft as amateur-built when it is registered with the FAA Registration Branch. FAA regulations allow for aircraft constructed from an amateur builder‘s original design, purchased plans, or pre-fabricated kit, to be registered as an experimental amateur-built category aircraft provided that the builder (or builders) demonstrate that he or she has fabricated or assembled over one-half of the aircraft. While FAA Advisory Circular (AC) 20-27G provides general guidance to amateur builders regarding the planning and construction of an experimental amateur-built category aircraft and refers builders to technical support available from the Experimental Aircraft Association and others, although its principal focus is to communicate and ensure compliance with the “major proportion” or “51-percent? rule” , namely: The major portion of the aircraft is defined as more than 50 percent of the fabrication and assembly tasks, commonly referred to as the “51-percent rule”. For example, an amateur-built kit found on the FAA List of Amateur-Built Aircraft Kits has 40 percent of the fabrication/assembly completed by the kit manufacturer. In order to be eligible for an experimental amateur-built airworthiness certificate, and per the major portion rule, the fabrication and assembly tasks that may be contracted out (for hire) to another individual (or builder/commercial assistance center) needs to be less than 10 percent. Experimental amateur-built category aircraft safety is largely managed by the community of experimental amateur-built category aircraft builders, owners, and kit manufacturers rather than by FAA regulatory requirements. A primary focus of FAA regulations governing the experimental amateur-built category aircraft building process seeks to ensure that the major portion of the construction work is done by the builder. Airworthiness certificates are granted to the experimental amateur-built category aircraft builder by the FAA based only on a review of documentation and a one-time inspection of the aircraft after it has been completed. Unlike foreign civil aviation authorities‘standards, there is no requirement for pre-approval of the project or in-process inspections of materials and workmanship. As part of the airworthiness certification process, experimental amateur-built category aircraft are assigned operating limitations specifying how and where the aircraft can be flown. Experimental amateur-built category aircraft operating limitations specify two phases of operation: Phase I, which is applicable to the flight test period and Phase II, which governs normal operations once testing is complete. Builders of experimental amateur-built category aircraft are required to certify that the flight test has been completed with an entry in the aircraft logbook. Although FAA guidance materials are explicit in advising the builder that the objective of the flight test is to carefully map the performance envelope of the aircraft and develop an aircraft flight manual, neither a flight test plan nor documentation of its accomplishment, in the form of an aircraft flight manual, are required to be submitted to, reviewed, or accepted by an FAA Aviation Safety Inspector (ASI) or FAA Designated Airworthiness Representative (DAR). Previous comparisons of experimental amateur-built category aircraft accident rates to other segments of general aviation have sought explanations for the substantially elevated accident rates, either as a proportion of the active aircraft fleet or of flight hours. One observation is that much higher proportions of experimental amateur-built category aircraft accidents occur early in the operational life of the aircraft, particularly during the Phase I flight test as a condition of airworthiness certification. The figure below compares the cumulative distributions of accident aircraft from 2001 through 2010 at various points in the total airframe lifespan (in hours) for experimental amateur-built category and non- experimental amateur-built category aircraft. 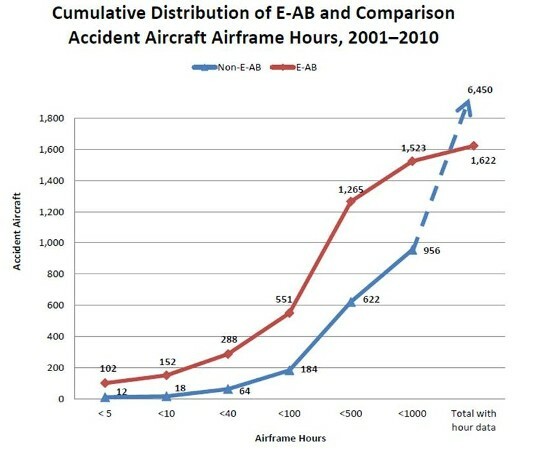 Direct comparison of the airframe hours at the time of the accident is difficult because of the likely differences in the operational history of the two groups of aircraft. However, the large difference in the number of experimental amateur-built category aircraft accidents occurring very early in the operational life of the aircraft suggests underlying differences between the two fleets of aircraft. For example, 152 of the 1,622 accident experimental amateur-built category aircraft (9 percent) with airframe data had fewer than 10 airframe hours at the time of the accident, compared with only 18 of the 6,450 non- experimental amateur-built category aircraft (.3 percent) with airframe data. This is despite a total fleet of and number of accidents involving, non- experimental amateur-built category aircraft being several times greater than that of experimental amateur-built category aircraft. An analysis of the accident occurrences and associated phases of flight provides further insight. Experimental amateur-built category and non- experimental amateur-built category aircraft accident characteristics were summarized using a coding structure developed by the Commercial Aviation Safety Team (CAST) and the International Civil Aviation Organization (ICAO) that are useful in describing the characteristic circumstances of aviation accidents. For ease of aggregate analysis and interpretation, the NTSB identifies one of the CAST-ICAO Common Taxonomy Team (CICTT) event codes as the defining event for each accident and that is the categorization used in this report to characterize accident circumstances. Each accident occurrence can also be associated with a CICTT phase code, identifying the phase of flight during which an accident occurred. The figure below compares experimental amateur-built category and non- experimental amateur-built category aircraft groups relative to the defining event for all accidents investigated between 2001 and 2010. 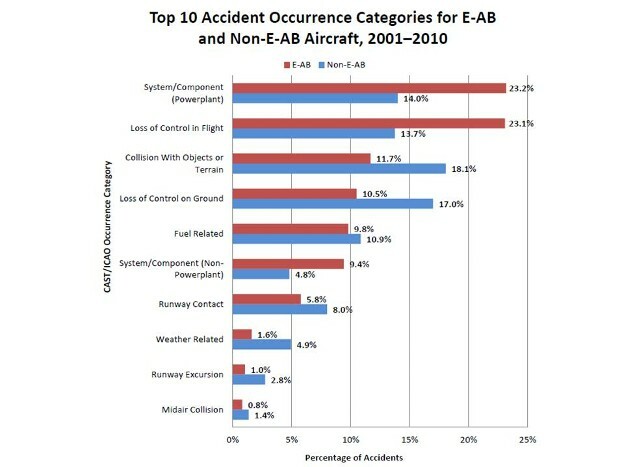 Powerplant failures and loss of aircraft control in flight were the most common accident events for experimental amateur-built category aircraft, while collisions with objects or terrain and loss of control on ground were the most common accident events for the non- experimental amateur-built category aircraft. A noticeably larger proportion of experimental amateur-built category aircraft accidents and fatal accidents involved system failures (either powerplant or non-powerplant). The difference in accident event types, and the typical impact forces involved with those events, identifies an important source of the historic difference in the fatal accident rates for experimental amateur-built category aircraft. Loss of aircraft control in flight was the most common event in fatal accidents for both groups of aircraft, but experimental amateur-built category aircraft experienced a noticeably greater proportion of loss of control in flight events than the non- experimental amateur-built category aircraft group. There is also a noticeable difference between the fatal accident histories of the two groups related to weather, with weather-related accident events being much less common for experimental amateur-built category aircraft. This likely reflects differences in aircraft usage associated with a smaller proportion of experimental amateur-built category aircraft certified for flight in instrument meteorological conditions.